I write most of my Tuesday-recipe posts ahead of time. [Sorry to burst your bubble – nope, I didn’t get up at 5am and write this]. This allows me to reliably get you Tuesday posts, even if my week is already falling to pieces. This works awesome for me, but sometimes I feel as if you miss out on some ‘in the moment’ life items. Which I try to combat with Amanda’s ‘Thinking Out Loud’ series. But today… today I thought I’d give you a glimpse into my morning. When this post goes up…this is what it will be like outside. You see those?? 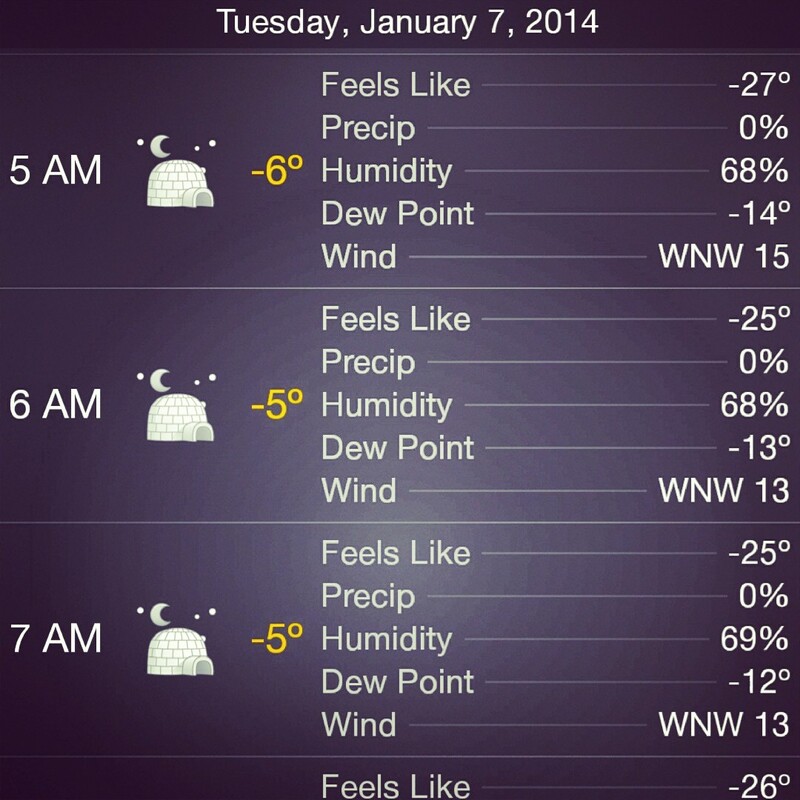 Those a freaking igloos on my weather app. I’m pretty sure Weather App thinks it’s being funny. You know what, Weather App? You’re not. There is nothing funny about ‘feels like’ -27 degrees. Oh, and that’s Fahrenheit, in case you were wondering. The Friday before Christmas Nathan had to go out of town to help his Uncle – which left me, at home for the night by myself. Now, this may not really seem like a big deal, but it kind of is. When Nathan and I met, and for the first 3 years of our relationship, he worked third shift on Friday, Saturday and Sunday nights. This was so incredibly normal to us – because it was what we had always known. The actual strange part was when he stopped working there (to go back to school), and I suddenly, for the first time in our entire relationship, had him 7 nights a week. It was a change I got used to very quickly, and I seriously couldn’t imagine going back. But when I was faced with another ‘Friday night alone’ I wanted to make sure I used it. One thing I used to do a lot on my weeknights alone was cooking experiments. Nathan is super awesome about trying my food experiments (the good, the bad, and the terrible), but I always felt ‘safer’ experimenting when I knew my dinner was the only thing at stake. As Friday afternoon rolled around I really wanted peanut and coconut milk sauce noodles. But I also kind of wanted vegan mac and cheese. And, I most certainly had chipotle peppers that needed to be used in the fridge. The thought of combining the three seemed a little overboard, though. But I figured it would give it a shot. And, I’ll save you the suspense and tell you that it was freaking amazing. I had to hold myself back from eating the ENTIRE pot. The main players in this dish is the coconut milk and the chipotle peppers. The coconut milk gives the dish an amazing creamy and full fat flavor that you’re used to having in mac ‘n’ cheese. 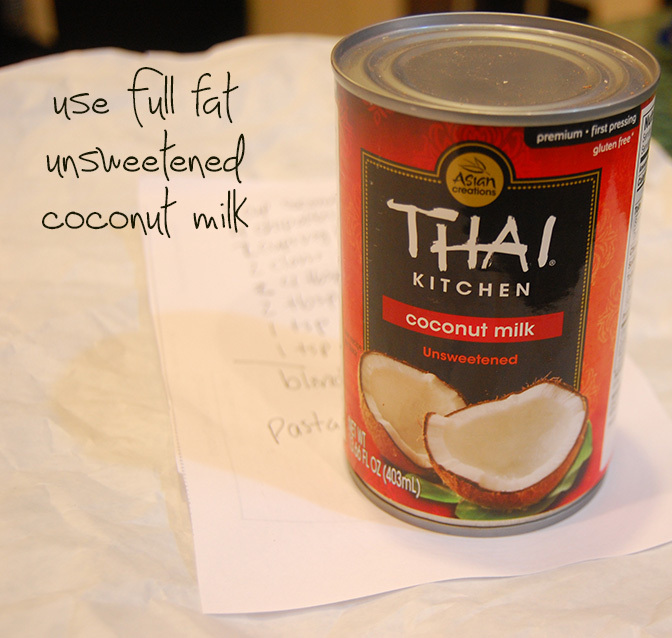 It is important to use the full fat coconut milk (from a can). You only use half a can in the recipe (unless, of course, you want to double it – which I highly suggest). If you need something to do with the other half of the can, this Sweet Peanut Butter Rice recipe is awesome. The chipotle peppers give this dish it’s smokey flavor, and just enough spice to ‘bite’ at the back of your throat. The essentially important step for the chipotle peppers is to de-seed them. The seeds hold the majority of the heat, and so taking out their seeds will allow you to get more of the rich smoky flavor, with less heat. To remove the seeds, lay the pepper flat on it’s side and slit down the long length of the pepper. This will allow you to open it up. Then I put my thumb on the top of the pepper and ran my knife down the length of it, stripping the seeds away. Be sure to wash your hands afterwards – these peppers are spicy! I used 4 peppers in my recipe, and it definitely had a kick, but it wasn’t bringing tears to my eyes. You can adjust the spice by going down (or up – bless you) on the peppers. If spicy or smoky totally isn’t your thing, you could substitute a roasted red pepper for the chipotles. 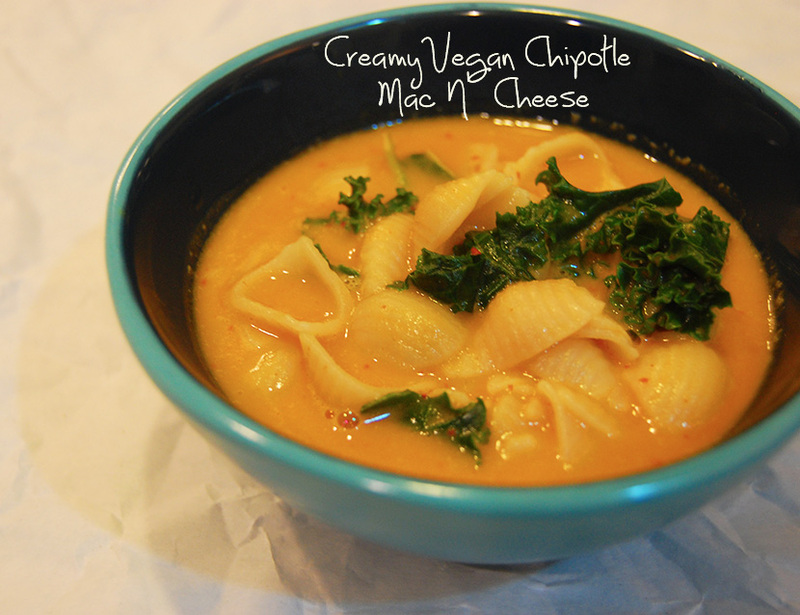 I added kale to the mac ‘n’ cheese this time – I love adding some greens to any pasta. If kale isn’t your thing, spinach, peas or broccoli would all work well too. With the kale or the spinach, I wilt it just enough to soften it by putting it in the strainer, and then draining the noodles on top of it. This allows the hot water to just soften the greens, without turning them to complete mush. For peas or broccoli I would add them to the water while the noodles were cooking (at the beginning if they were frozen, in the last few minutes if they were not) to soften them up. Or – you can leave the greens out completely. Are you ready? Because once you taste this – there’s no going back! Put a large pot of water on to boil. If using peas or broccoli, add them to the water to soften. 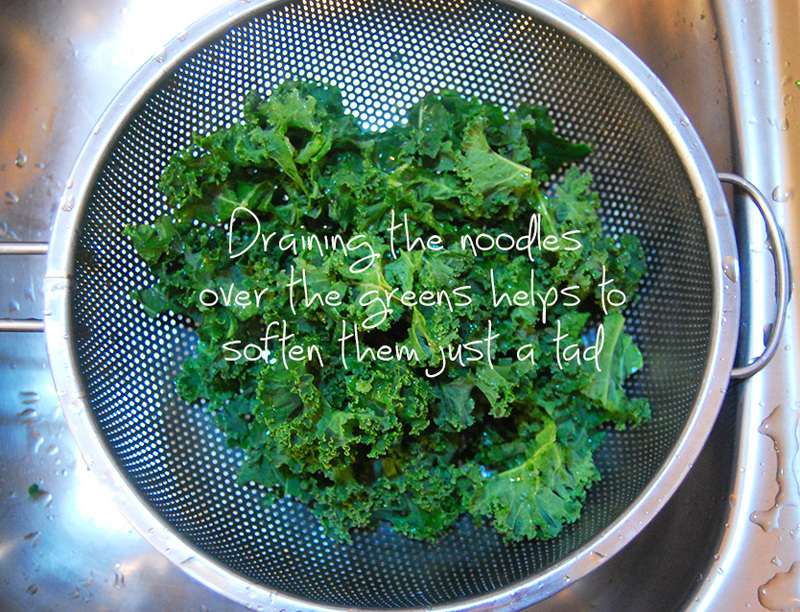 If using kale or spinach, wash and place in strainer that you will use to drain the noodles. Once boiling, add the noodles to the water and cook according to the package directions. When they are done, drain and return to pot. Serve warm. Store leftovers in an airtight container once cooled. *I waver between 1.5 and 2 cups of vegetable broth. 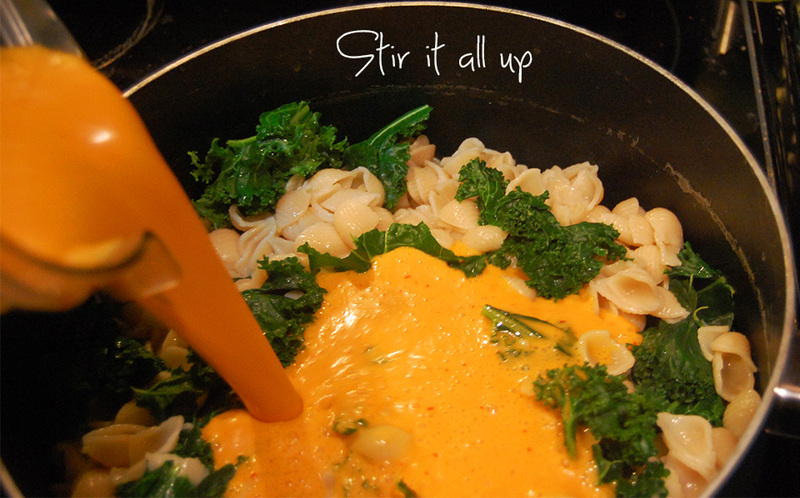 With 1.5 cups, the sauce is perfect the day you make it, but a bit dry when heated up with leftovers. With 2 cups, it's a bit liquidy on day one, but perfect when reheated. So, choose the broth amount based on if you plan to eat it all in one sitting or not. I added this recipe to a recipe roundup, click here to see other awesome recipes! This recipe was featured on Finding Vegan! My weather app hasn’t been making me smile either, but the good news about bad weather is that it makes comfort dishes like this even more delicious. Hooooly wow does this look good.